I don't see myself as a sneezy, allergic person. I grew up with two cats, had cats as an adult, and now we have two furry dogs who share our house, bed, and last name. I don't run from dust, or panic when things start to bloom in the spring. But once or twice a year I get hay fever something awful. My allergies get so bad that I literally can't think straight. My mind is muddled and I feel like I'm trying to hear from under a deep, murky water. I can't sleep for all the stuffiness and sneezing. I can't be my magical, high-functioning, get-it-done, and get-it-done-quickly gal. I don't know about you, but when I get sick I suffer not only from the ailment itself, but from a hopeless sense of defeat and frustration. Why did this happen to me? I'm healthy! I do everything right! I take bone broth! I get enough sleep! I avoid processed foods! I do yoga! I end up sick, sad and cranky. I'm super fun to be around during these times. You should come over. Enter Jonathan with his helpful idea that I take Claritin. I don't like prescription medication, and I avoid over-the-counter pharmaceuticals. I like natural remedies. The kinds that don't do more harm than good while they address symptoms. But I was so desperate for relief that I decided to try a Claritin, followed that night by a Benadryl chaser. The results were not good. Unless you think shaky hands and yelling at your young child sound appealing. Oh, and the allergy symptoms were still there. So Jonathan went back to the medicine cabinet, as desperate as I for the relief that would restore our happy household. This time he came out with an old bottle of something I'd bought years ago when I had spring hay fever. This stuff wiped out my allergies right away! It's a homeopathic remedy, and before you roll your eyes I'll cut to the punchline: In less than 24 hours it wiped out my misery. 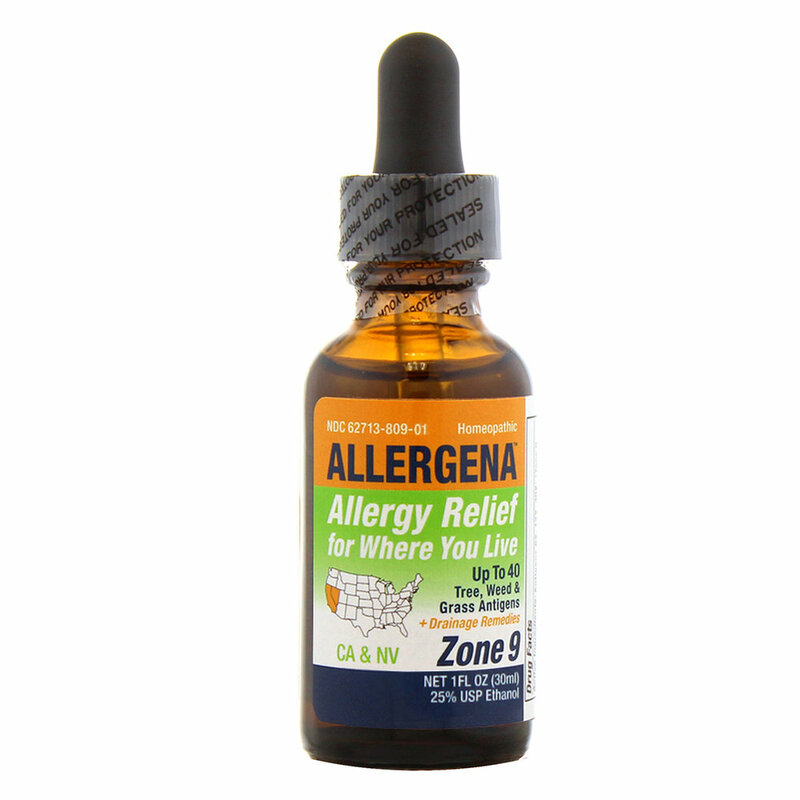 Allergena works by including up to 40 tree, weed and grass extracts from "Zone 9." That's what grows in California where I live. If you suffer from allergies related to pollen, grasses, etc. I urge you to grab a bottle at once for the zone where you live. If you're suffering on vacation, get the formula for wherever you are. They also make a concoction for dust and mold, so there's something for everyone! I'm so grateful for this stuff. I've been talking to strangers about it. Anyone I see who seems like they are suffering from the crazy pollen load we have around here gets my tip. And now you have it, too. P.S. Forward this to to the people you love with allergies!